Camping and hiking with an instant tent that is easy to use and sturdy makes the experience even better than it already is. The perfect instant tent has a lot of features that make it even more convenient for the hiker or camper. The pre-attached poles and durable construction make set up a snap. Our pick, Coleman 6-Person Instant Cabin, is not only a well known brand but it is convenient and feature rich as well. Instant tents are tents that are designed to be set up in minutes rather than taking a long time with poles and tent stakes. Most instant tents can be set up by one person in under 2 minutes with no problems. The pole or frame system of an instant tent is pre-attached to the tent so you don’t have to worry about connecting the right poles which can be confusing. There are very little loose parts with an instant tent which is what makes them so appealing for hiking and camping trips. Instant tents can be used for festivals, backpacking, hiking, camping and even playing in the backyard. They are extremely popular and come in a variety of sizes, styles and weather-resistances. To choose the right instant tent for your needs you need to consider several things, most importantly, what your needs are. Knowing what your specific needs are will help you sort through the hundreds of different instant tents so you can choose the right one for your activities. Knowing what is most important to you when it comes to an instant tent will help narrow the field when you start researching different models. Using this buyer’s guide will eliminate confusion and stress and will result in a purchase that you will use and love for years to come. All you have to do is extend the tent and secure it. You can set up the Coleman instant cabin in less than 2 minutes. The Polyester material is 150D with 150D taped seams for durability and strength. The welded floors and seams that are inverted prevent water from seeping into the tent. There is also an integrated rainfly that is vented and provides the airflow you need without having to assemble anything extra. The instant cabin tent from Coleman measures 10’ x 9’ with a 6’ center height. There is plenty of room inside to put two queen-sized air mattresses. There are two storage pockets that help you keep track of small items you may need while camping. Take down is easy; just fold it up and put it into the carry bag that is expandable and features a rip strip. If you are looking for a tent that has plenty of room and sets up in an instant, this Core 6 person instant cabin tent is the way to go. You can sleep 6 people in this tent and it has enough room for two queen mattresses. The center height is 72”. There is an adjustable ground vent and features CORE H20 Block Technology. Other features include a gear loft with a hook for a lantern, a large wall organizer that will keep your tent neat and items off the floor. There is also a rainfly, carry bag that holds everything and tent stakes to secure the tent even in windy conditions. There is also an electrical cord access port that can be closed fully when it is not being used. The dome style is stylish and can be set up in less than about 60 seconds. The CORE H20 Block technology is a combination of water repellence and bead technology that ensures water run-off. The sealed seams and window seals and door are water resistant as well. Measurements of this convenient, instant tent are 11’ x 9’. There are also panels on the doors and windows that have zippers for added privacy when camping in public campgrounds. Choose a tent that provides stress-free setup that can be done in just minutes and purchase this FiveJoy instant dome tent that sleeps 4 people. There are mesh windows on the left and right sides that are covered with a solid nylon flap or you can leave them open with just the mesh. The fresh air can come in while bugs stay off. The convenient double doors on either side of the tent allow it to be either completely open, sealed with the nylon door, or closed using only the mesh. 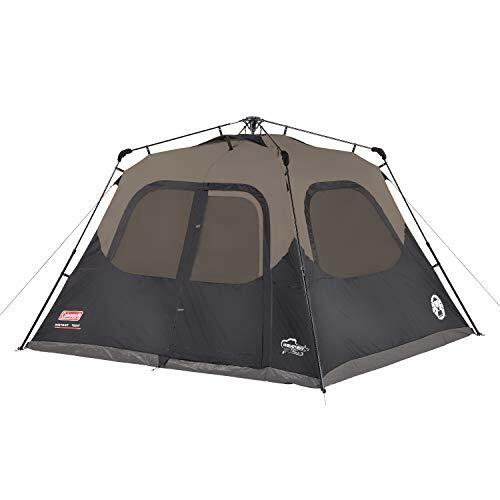 Features of this convenient and easy to use instant tent include a hanging loop that helps to keep the inside of your tent organized along with the storage pockets. You can put your car keys or cell phone in the storage pockets and keep them safe and where you will know where to find them. 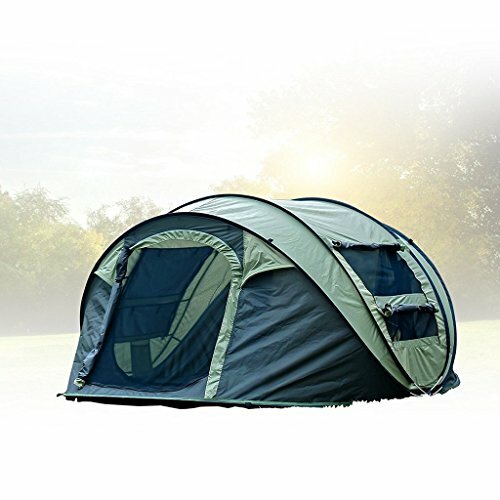 The windows of this tent can be used as a rainfly as well by attaching lines to the loops and securing them a short distance away from your tent. The lines to secure the tent and the tent stakes are included with purchase. This tent is built to stand up to lots of use with its quality zippers and durable seams. There is also durable polyester that is water resistant and PU coated. 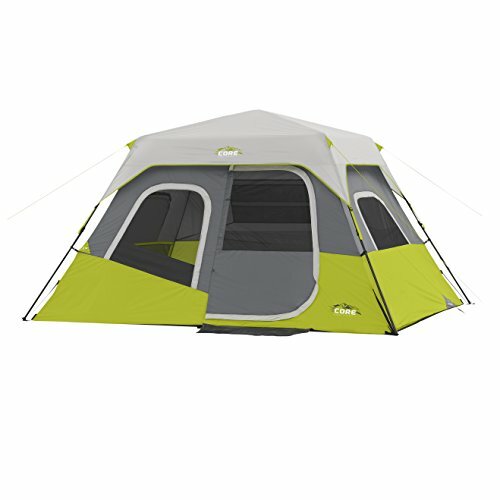 Everything about this FiveJoy tent was designed for convenience, comfort and long lasting, easy use. This instant tent is perfect for family gatherings, camping, hiking and other recreational activities. The zippered screen and exterior door is made of durable, high quality nylon. It is not designed for use in heavy rain or extreme backpacking. When it comes to buying a tent, campers will oftentimes purchase much more tent than they need or much less. If you don’t know what to look for or you are not familiar with how a tent is measured and capacity is decided, you could have this problem as well. The purpose of this guide is to prevent you from making this mistake by providing you with the information you need to make the right decision. The three instant tents that we have reviewed here are top rated tents that are very popular with outdoor enthusiasts. They are all super easy and fast to set up. You can get your tent set up in less than 2 minutes and there are no separate poles to worry about. If none of these three tents are quite what you were looking for read our buyer’s guide below. This guide will provide you with the information you need to learn about the different types of instant tents there are on the market and how to determine which style and type will be the best for your needs. With this knowledge you will be able to choose the right tent like a pro and be confident with your decision. Before you purchase a tent it will help to understand the differences between the instant tents on the market and how to determine what you need. Most tents will have specific uses when it comes to seasons and weather conditions so it is important that you choose a tent that will accommodate the kind of camping and outdoor activities that you will be using it for. We have listed the different types of instant tents below along with some information about each so you can decide which one works best for your needs. Summer Tents – This type of tent is perfect for hot weather and should only be used in the summertime. There is a lot of mesh in these types of tents to allow for the maximum amount of airflow which will keep the tent cooler in hotter temperatures. The rainflys on these summer tents stop several inches above the ground to ensure that no air is blocked. Three-season Tents – These tents are very versatile and can be used in the summer, spring and fall. They are strong and durable and are made of a combination of solid nylon panels and lots of mesh. The full coverage rainfly extends to the ground to provide plenty of protection from the rain. This type of tent is one of the most popular styles of tents on the market due to their versatility. Convertible/All-Season Tents – If you like to camp in all types of weather, an all-season tent is the way to go. Most combination/all-season tents have many features that you will find in other styles including rainflys, vestibules and mesh windows with solid flaps. This allows you to take off the elements you don’t need depending on the season you are camping in. These tents are usually much heavier than other styles so this might be a better choice for those who enjoy car camping where you will not have to hike to get to your camping spot. Winter Tents – Do you love to camp or hike in extreme winter conditions? Purchase a winter instant tent. These heavy-duty durable tents are made with tough fabrics and have a strong frame to withstand wind or bad weather. Now that you have an idea of the style of tent you want, it’s time to think about the kind of features that you will use. No tent will have ALL features, but if you know what features are important to you, you will be able to sort through and eliminate the ones that don’t have the features you are looking for. A few of the most important features to consider and look for include easy, instant setup; cost, size, and portability. Cost – One of the first things people ask when they are going to purchase something is how much does it cost? While budget and getting a great deal is important, you should never choose a tent SOLEY based on this factor. Cheaper tents have a bad tendency to be cheaply made tents as well so remember that you get what you pay for. Look for tents that check as many of the items off as possible. The one that has the most features that you want is the right choice for your needs. Space – Most of the time when you are camping, especially hiking trips, you will want to engage in some forms of activities like kick ball or tossing the Frisbee, football or baseball but that is all done in the great outdoors. The size of your tent will determine how many things you can bring with you and how many people you can accommodate. Set Up Time – Quick and easy set up is the name of the game with an instant tent. Most models can be set up in 2 minutes or less and taken down almost as fast. The ease in which your tent can be set up is a major factor in how popular it would be. Portability – If you do a lot of backpacking and hiking you will want to look for an instant tent that is lightweight and not heavy. Every ounce counts when you are hiking so make sure that you look for tents that will pack up well into a backpack and that have a convenient carry bag. If you are new to camping, choosing the right instant tent may feel like an overwhelming task. All it takes to choose a tent that will work for your hiking and camping trips is understanding the different types of tents on the market and what they are best used for. Most tents are designed for specific types of weather. Think about when you will be going camping or hiking and choose an instant tent accordingly. Many tents are designed for several seasons and are the most convenient but they can weigh more than tents that are only designed for summer or spring camping. You will love the convenience of an instant tent especially if you arrive to the campsite later and want to get set up quickly. Rather than battle poles and different pieces of the tent all you have to do is extend and secure and you’re done. Make sure you take the different features you are looking for into consideration. Features are designed to make the tent even more convenient for the camper and can include extra ventilation, waterproof capabilities, extra strength seams and zippers, hanging hooks and storage pockets, rainflys and much more. The right instant tent will make a big difference in your camping or hiking experience. When you have a comfortable place to relax and rest at the campsite you will have an even more enjoyable time without struggle or time-consuming tent assembly. It will set up and take down in minutes and leave you with more time to enjoy your camping activities.